There are many amazing things about young children. For instance, they go from being a totally helpless infant at birth to a much more independent toddler. They progress from needing an adult to turn them over to becoming an active crawler in just a few short months. And, even more amazing, they start life with no language at all and by age two are talking. How does that happen? How do children learn language and develop the ability to communicate verbally with others? As it turns out, parents have a lot to do with this amazing and extraordinary accomplishment. Most of the time you are making significant contributions to your young child’s language development without even being aware what exactly you are doing that is helping him or her become a talker. I was watching a baby at a nearby table in a restaurant recently. When this cute baby who was about six months of age started babbling, several adults who were close enough to hear her started talking to her by making babbling sounds in imitation of her. Her mother leaned closer to her and started telling her what a good talker she was and talked to her as if she could understand the little girl. None of the adults in this situation were responding to the girl in order to “teach” her to talk; they were simply compelled to respond. But they all did the right thing. All babies – no matter what country or culture they are in – start babbling at about six months of age. And they all use the same cooing sounds and repeat the same consonant-vowel combinations. Most will babble such sounds as “bababa” or “mamama.” But for babbling to develop further, infants must hear human speech. In other words, they have to be exposed to people who are talking. As babies hear others talk, they babble even more. Soon, some words or sounds that could be words begin to be uttered. And by 10 or 12 months, there are sounds appearing that can be distinguished as words. But in order to become a communicator, infants have to engage in other activities aside from hearing their parents or other people talk. For one thing, early in that first year, usually by three or four months of age, babies are able to gaze in the same direction as adults are looking. By the end of the first year, they are more skilled at this. That’s when something called joint attention begins between parents and child. When young children take part in this joint attention experience, they are comprehending more language (in this example, the child hears the words “pretty” and “delicious”), they are learning and may be producing gestures (both Dad and child may point at the cake), and they will develop their vocabulary quicker. By being aware of the importance of a simple concept like joint attention, you can help your child develop her language skills much quicker and more powerfully. 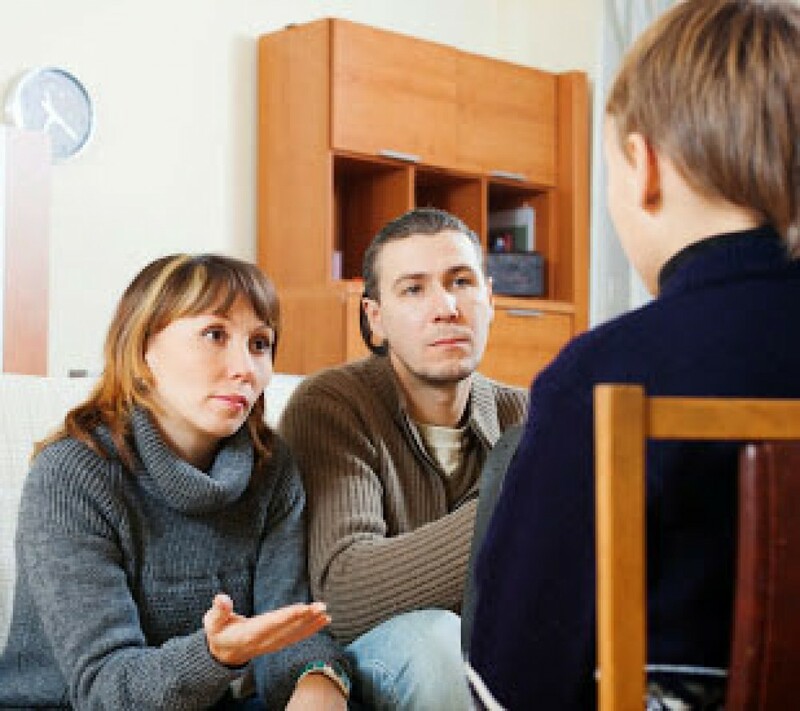 It’s one thing to talk to your child, but it’s quite another to make sure there is joint attention and that what you are saying refers to what you are both watching. Joint attention and the language that goes along with it can take place many times a day. What this does besides what I’ve just mentioned is to also establish a common ground between you and your child. You are sharing an experience. By looking at an object or event together and then by you talking about it, your child will be able to figure out the meaning of many of your words – even if you don’t stop to explain each one. This leads to a richer vocabulary and something else very important in your child’s development — an increased attention span. Should You Worry about Your Rebellious, Nonconforming Teenager? The stereotype of the troubled teenager is the adolescent who is rebellious and is fighting against the conventions and standards of their parents and the rest of society. When many adults think about teenagers and picture the “typical” teen, the image that may pop into their mind is that of the long-haired, drug-using hippy, the gang member who uses drugs and engages in gratuitous violence, or the tattooed adolescent who has nose rings and seems bent on upsetting all adults. But are these teens the norm or are they atypical teenagers who give the rest of the adolescent population a bad reputation? The fact is that only a minority of adolescents rebel against their parents or society at large. Most teens enjoy a relatively smooth teenage period, and while they might not always see eye-to-eye with their parents or teachers, they are not intent on making life miserable for all adults. But even with those teens who might be legitimately labeled as rebels, what passes for rebellious and oppositional behavior may really be about learning to be their own person. So much of what goes on in the life of a middle teenager – those kids between 14 and 16 – may be more about learning to be their own person than purposely trying to go against social conventions. Kids who take risks, by getting tattoos their parents don’t like, having jewelry in various parts of their anatomy, or taking on the behaviors and attitudes of groups far different from those of their family, may be attempting to assert some of their own ideas while trying to figure out in what direction they are headed. Which, of course, is undoubtedly true. Many parents of adolescents would like to make sure their child never deviates from the conventional behavior and attitudes that are the norm in their family. Some even try to rule with an iron fist and force their teens to comply with parental demands and expectations. While it might easier – and less embarrassing – to make sure your teen never strays from the conventional norms of the family, this would not necessarily result in healthier young adults. In fact, the opposite might be true. Most teenagers, it is safe to say, certainly want fewer restrictions, more independence, and the freedom to choose to take some risks. A good many teens see the conventions of their family and their family’s friends as boring and unimaginative. If parents can handle the mild rebelliousness that some teens need to exhibit without clamping down too hard on their need to be different, things can be relatively easy for both parents and teens. But, if adolescents are handled with too many restrictions and the reins held too tightly, this may encourage greater rebellion. Instead of having a certain amount of freedom to figure out who they are, they may expend a great amount of youthful time and energy going against the authority represented by their parents. The bottom line, then, is that teenagers who display a little rebellion and sometimes take some risks by choosing their own ways of doing things, in the long run may become individuals with a better idea of who they are. Having had the opportunity of trying on different behaviors, they are not forced into any one way of being – which might happen if they are in an on-going struggle with adult society. But this requires you to tolerate the teenager who wants to do his own thing and wishes not to be stuck in “old-fashioned” ways of living his or her life. Teens who have been allowed the freedom to rebel and seek their own path to independence often settle into an adult persona that is – as we usually find out when our teens graduate into adulthood – uncomfortably like our own. Toilet Training Your Child is a Big Deal – For Both of You! Toilet training your young child is a major event in the life of your child – not to mention in your own life as well. After two or more years of changing diapers and waiting for the big day to arrive when your youngster begins to notify you that she has to go – and she actually does use the potty successfully – is like a day of liberation. It’s one less concern in the daily care of your child. However, getting to that day can be a real challenge – both for you and your child. Most children are ready to begin toilet training by somewhere between the ages of two and three. The average age is about two years and eight months. Many parents, however, think that they can have their child trained by age two, but many children are just not physically mature enough prior to age two to control their urination or bowel movements. You may think that it is just a matter of will or of compliance, but children first have to be aware of the sensation of a full bladder. That usually doesn’t come about until later in the year between ages one and two. However, in addition to recognizing the signs of a full bladder, then they have to have a certain amount of control over the muscles controlling urination so that they can postpone urination until they get to a toilet or potty. Again, that control may not appear before age two. The same process is true of bowel movements. First the youngster has to recognize the fullness of the lower bowel and then has to be able to indicate that need. And that, too, doesn’t come about until between ages two and three. Not only do they have to recognize their readiness to go to the toilet, but they have to be able to get to the potty in time to eliminate there. As it turns out, both nighttime bladder and bowel control comes before daytime bladder and bowel control. That’s the physical part, what about the temperamental part? You usually need to take your cues from your child in order to decide the right time to begin toilet training. Starting too early can create problems as some children become oppositional about using the potty when they feel pressured and this may delay the overall accomplishment of successful toilet training. However, most children, if you are fairly relaxed about the start of toileting training will give you the major signs as to when they are ready. What is the best way to teach toileting behaviors? There are a wide variety of approaches and both your family background and your cultural expectations will play a part in how you think you should teach your child to use the potty. But, the use of a potty chair often works well because it is easier for a child to use and might not be as intimidating as the regular toilet. If you have come to recognize your child’s patterns of urination and defecation, you can call attention to what is happening (for instance, where your child is grunting at a regular time after a meal) and then associate this with using the potty (“When you feel like you have to poop, then I can help you use the potty”). When children have bedtime and sleep problems at ages three, four, and five, those problems can often be traced back to the development of poor sleep habits at younger ages. For instance, Tracey, age 4, whined and complained about going to bed at night. She found excuses to try to stay up later, and when she ran out of excuses she would cry and leave her bedroom. And Reid, age 3, had temper tantrums at bedtime and insisted one of his parents stay in his room and sleep beside him. If his mother or father tried to leave the room before Reid was sound asleep, he would cry and fuss until they lay back down beside him. Many such sleep and bedtime problems can be avoided by establishing bedtime routines between six and 12 months of age. Children do much better at bedtime if they know what to expect at the end of each day. In other words, if you create a predictable sequence of events that you follow consistently every evening, your child will feel secure and will be ready to go to sleep by the end of the routine. Once established during the second six months of life, the basics of your child’s bedtime routine will be established and although some aspects of it might change somewhat, the basics routine will stay the same. This routine should not be lengthy, but it should be consistently followed. However, no matter how you tweak this kind of bedtime ritual, it works best if it is preceded by about an hour of quiet time or winding down activity. Engaging in roughhousing with your child — wrestling, watching stimulating videos, or running around — are not conducive to what is needed for good sleep; and that is a peaceful and quiet transition period. Specific bedtime. Children function best when there is a predictable routine. A good place to start is by setting a bedtime and not deviating from this time. Advance warnings. Your child may be far too young to tell time or know how long 15 minutes is. But by announcing that it is almost time for a bath or for putting on pajamas helps her to begin to associate certain events with the approaching bedtime. For example, saying “It’s almost seven o’clock and time for bed,” won’t be much help, but saying, “I’m going to start your bath” and then turning on the water in the bathtub will be a signal that she will learn to associate with getting ready to go to sleep. Snack. A light snack of foods that include protein and carbohydrates will tend to help induce sleep. Protein will keep his blood sugar level on an even keel until breakfast the next morning, while carbohydrates will make him sleepy. Warm bath. A warm bath will be relaxing and by raising your child’s body temperature slightly, she will be more likely to fall asleep easily. Story. Reading a story is also relaxing and comforting. Not only are you teaching your child about reading and language, but you are providing a comfortable experience that will, in time, be associated with sleep. As your child develops favorite stories and loved books, she will ask to be read the same ones over and over. By reading her favorite books, she will feel secure and be more relaxed and ready to go to sleep. Finally, always make a final kiss and hug fairly brief. Prolonged goodbyes may signal your anxiety and may lead to your child crying or being anxious when you try to leave. Anxiety often results in crying – rather than a final goodnight and gentle sleep. Teens often Assert their Independence by Refusing to take Prescribed Medication. A friend’s 18-year-old son recently decided he didn’t want to take his ADHD medication anymore. “I don’t think I need it anymore, because I’m doing so well,” he told his parents. Three weeks later, his parents found out he was in danger of failing a class he needed to get into the college he selected. But, of course, his parents were worried. Over the years, I worked with many adolescents and their families. Some of the teens took medication for the symptoms of ADHD; others were prescribed medications for other medical conditions, such as diabetes or seizure disorders. But there was a pattern that I began to recognize. As teenagers reached their middle and late adolescent years, there was an increasing need to be self-sufficient, independent, and autonomous. They wanted to be grown up and to be their own person. For many of them this meant that they no longer wanted to be dependent on a drug or a medication. They needed to prove to themselves and others that they were an adult and that they were capable of handling their problems and symptoms without the aid of a medication. For some, it was like taking a medication meant weaknesses or a crippling dependency. It frequently reminded me of the toddler who proclaims “Me do it!” whenever an adult tries to assist them. One adolescent I saw for counseling during his junior and senior years in high school, credited his success in high school to the medication he took to deal with his short attention span. In his second semester in college, he came back to see me during a spring break. He did, however, agree to start taking his medication again, and as I anticipated, his grades went up. Taking drugs, for many teens, becomes one more battleground in the adolescent power struggle and the need to assert greater personal autonomy. In other words, rebelling against the taking of medication – even when it is important for maintaining good health – is a way teenagers can feel more in control of their own lives. For example, Diana resents every pill she puts in her mouth to manage her seizure disorder. At 16, Diana was still living at home and going to high school. She had frequently had seizures in school, which resulted in her being taken by ambulance to an ER. She knew the medication prevented seizures, but still she resented taking the medication. As a compromise with her parents, she said that she would not stop taking her medication until she was 17. It is probably very clear to you that your adolescent might not be able to function adequately when not taking their medication. However, it is likely that your child has other issues – such as the need for independence, autonomy, and personal power – that may overshadow their judgment and commonsense. Although your teenager may resent you telling them they need to continue taking their medication, a doctor, who is not their parent, is more likely to be listened to as an authority. If the doctor’s authority doesn’t work, you may have to stand by while your teen tests out their ability to function without their medication. Although this might be difficult for you, you may be able to be supportive and help them make a healthy decision once they have figured out that they can’t control a medical condition without medication. If you have been engaging in a conflict with your teen over the use of their medication, they just might hide their condition from you so that they don’t have to admit they were wrong or made a poor choice.